Can you care for a monster that is trying to eat you? A clicker game, about collecting and feeding animals. This software generates a 2 word phrase with 2 syllabels each. It's going pretty good, I have several of the basic systems worked out so that the same functions can be reused. I am currently making the monster. I am planing on making devlogs about Care Escape as I make the game. I published the first one here https://20potter.itch.io/care-escape/devlog/47589/care-escape, if reading about that will interest you I invite you to follow me. Hello, I'm 20potter, I am also a Dan. I did not have the pleasure of joining previously. This is my second jam ever, I started doing jam because I have the habit of doing bigger jobs and then giving up early. So I wanted to put some successes under my belt. My favorite games are pathfinder, and final fantasy tactics. I have seen inspiration from them at various points. I started game development back when I was in elementary school, and I am now a college graduate. I have some experience with at least a dozen engines. I have particularly come to like godot. I love games, both digital and table-top. I intend to focus a little bit on having more animated sprites, as I am use to using mostly static sprites. I intend to make a complete game play experience. I am not a veteran, but my biggest recommendation is keep your goals in check. A game jam is a place to dream small so you can realize your dream in a good time period. My Lord's Zoological Society, was made for the 9 day idle/clicker jam that took place from june 29th to july 8th, 2018. 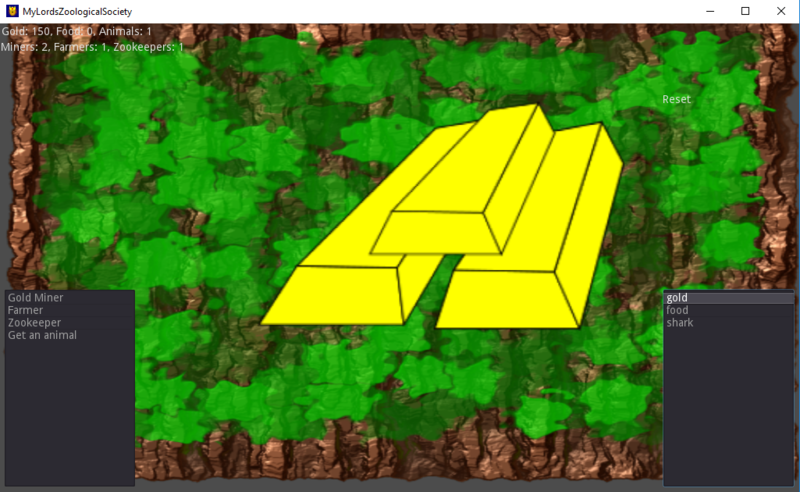 It is a clicker game about gathering food and gold in order to care for animals. So I am playing around in godot, specifically I am making a small memory game. Basically I have it so you can give it a number and it will make a series of buttons. I have it so the y coordinate will after 10 buttons increase using the formula 200+(floor(CardNumber/11)*100). What I am trying to figure out is a good way to make the x coordinate decrease after the 10 buttons so the buttons form rows of 10. I could probably do it through some if then, but it would be a bit cleaner and neater to do it in a single formula. The current formula is -100+(CardNumber*100). An idea I had a while ago that I eventually plan to get back to that was quite fun is a rogue like farming simulator where you gather seeds to make plants and fight demons. You can get a specfic plant that lets you place seeds in a pod that will appear in your next lifetime and enable you to gather new seeds across multiple worlds. You can then make combination plants from your seeds. In order to be able to win you would have to go through multiple worlds gathering seeds. Some progress has been made by looking through documentation. When making a google script into a google app you pass through a variable, looking into that variable it is an object that takes a query string from the url. So I should be able to through godot edit a .URL or a .html to send the info. Now I just need to find a way to hide it. It isn't completely unmentioned, rather it would gather data that a form would have problems telling me. Such as what choices the player made throughout the game, how often the player reloaded to change their choice immediately after making a choice. I don't mind adding an opt in button. I just rather not break immersion or confuse a player when a new window suddenly pops up. 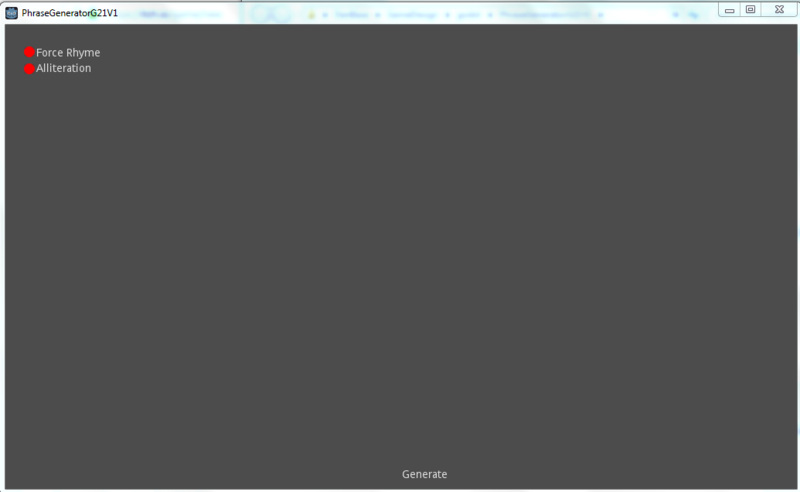 It is a simple phrase generator, it generates phrases that are 2 words with 2 syllables each. Each syllable contains a consonant and a vowel. It can also be made to generate words with rhyming or alliteration. It is quite simple, and the phrase generator can be ran in silent mode, that way all the options and output can be handled viva editing text documents. This means if you are designing a game with rogue-like elements you could use this tool to generate names for things, or bizarre catch phrases. To run it in silent mode you must change SilentRun.txt to true in it's text document, set force alliteration and force rhyme to your desire settings by changing their txt files. After running silentrun.vbs it will change the phrase.txt in the save directory to the result. An example result is ugoj ufoj with both force alliteration on and force rhyming on. I am writing this after having spent some time playing around with modding axu. It took me forever to find it, more so because I did not see it on https://cynapse077.itch.io/axu-rl for some time. I suggest before you start modding to back up any save you want to keep, and extract a new copy of the game for modding. Note that I am pretty certain this is covering 5.2 , which at the time of writing this a 5.3 has come out, so some things my not be the same. In the folder that you extract the files to is Axu_Data , within that is StreamingAssets . In side StreamingAssets is Data. Data is basically your options menu for deciding what sort of modding you want to do. Within each of the files below data are .json files, these can be edited in notepad or similar text editor. Remember if you use a text editor other then notepad to make sure the editor does not have tons of format code that will mess things up. To make a profession you go to entity Data and open up profession. Commas separate out each profession. I recommend if you want to make a new profession to copy a pre-existing one and edit that. Make sure that the last profession does not end with a comma because I have done that many times. The first profession I tried to make was the unstable, a ball of instability that is constantly morphing. My method was to give the unstable leprosy to remove limbs, and radiation blast to grow new ones. Leprosy is a trait, and radiation blast is an ability. You can replace the pre-existing traits in the profession with the trait id you want. Same with abilities. Random traits of a mutant are hard coded rather then something in the profession data. Otherwise the combination of leprosy and radiation blase almost worked, but leprosy works faster then radiation from radiation blast. It seemed that you would lose one limb, before you would mutate once. That made it almost fast enough, but if your mutation did something other then grow a limb you would be doomed. Also unless you grow a head before it falls off you are doomed. In addition I lost my off-hand and grew an extra hand, but sadly an extra hand can’t serve as a replacement for an off-hand. That was when I tried to figure out a way to make radiation work faster. I attempted making a radiation blast that would apply the effect "Radiate_Self" multiple times, however it seems that abilities can only have one effect. I also tried making an ability that produces items so I could radiate myself, but I couldn’t figure out how. A thing that would be a nice addition is more control over effects. Maybe if they had their own data file so that they could be modified at a numeric level. After that I tried making a creature with 6 extra arms, 6 extra heads and 6 extra legs. Turns out if you simply use the id for each trait it doesn’t add the body slot. I also set all stats starting values to 1. This experiment also showed that speed changes not just movement speed but attack speed. I noticed this because my attacks did little but I got a large number of them quickly increasing my proficiencies far faster then normal. While I am on the topic of proficiencies, I noticed that thrown and abilities level up with usage, but the other proficiencies and your main level only go up when used against an enemy. I am also not entirely sure how most of the stats work, or how damage for abilities is determined.